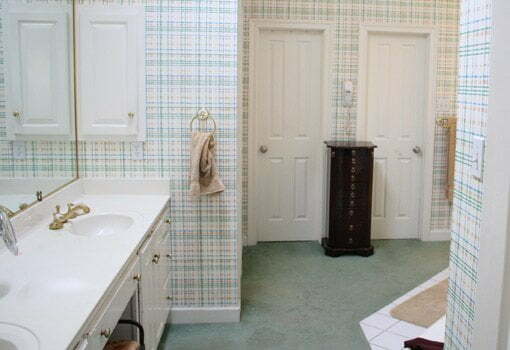 The plaid wallpaper and carpeted floor in this bathroom had seen better days and was in need of an update! Hi, One of my bathrooms has a large shower but the room is then very small. I only have room for a 18″ wide bathroom vanity cabinet. I bought one and put it together. It is a cheap one knowing I will spend lots of the fixtures for the bathroom. I left the lower front kick plate off the cabinet to use it for a drawer front. I can order a drawer made to order for this area. I do need to clear the bathroom floor and area rug when opening up the drawer on the bottom of the cabinet. Therefore I am thinking of floating the cabinet. My walls are still open, only thinking of what to do at this point. Therefore I can install wood to support the cabinet with a granite top around the under-mount sink which is heavy. Will this press-board cabinet withstand brackets underneath or will it fall apart. Which brackets could I use for this, I do not need it lifted more than 4″-8″. the back is mostly open on the cabinet also. Or can I add legs, I only have thin press-board on the side and need to keep the front clear for drawer to open up. I have even tried to look for another cabinet but do not really want to spend $500.00 so I can have a draw. Even then it is hard to find in this size. I could use the storage space. I was thinking of somehow lifting the cabinet on both sides by gluing something across both sides on top of the tile and then gluing the cabinet on top of this wood to lift it a little but afraid it would collapse. or screwing 2 wood strip on both sides through the floor tile then putting the vanity on top of this. I would then possibly have leakage on the floor below and do not want to do this. also the wood has to be narrow to clear the drawer box. to install it. Would it be under the shower pan and under the floor tile and all the way or only part of the way? Not sure about this? Different types of drains are removed differently. Most will require access from the back of the tub, where the faucet is. You may also be able to remove the drain by inserting the handle end of pliers in the tub drain and turning the pliers to loosen it. There is also a special plumbing tool available to do this. Your question was answered in the first hour of our January 18th Today’s Homeowner radio show. Yes, on all the make-overs. You always do a beautiful job. But what if someone would like to preserve the retro-look? Some of the Pink or the Brown-and-Tan bathrooms were really quite lovely to incorporate into an update. Being an old home lover, I hate to destroy “vintage” especially if it is high quality and unavailable today. By the way, in thirty years, people are going to be saying, “they made these bathrooms look like hotel bathrooms.” And we are doing that, in many instances. The only thing nice about a hotel bathroom is that you see it clean and uncluttered. They are all the same! And quite honestly, bland.